The equestrian center has been established inside one of the biggest and most famous trotting horse farm in Italy: the stud farm Trio. Main mission of the center is the care and the well being of the horse, thanks to a staff with 20-year of experience in horse care. The center is easily reachable: just 2km from the Via Emilia and 1 km from the Stradelli Guelfi road. The location includes more than 50 hectares of nature and a sand training area of 3 kms, at customer's disposal. 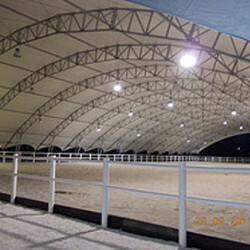 The facility has 3 new outdoor fields, an indoor paddock among the widest in Italy and is equipped with more than 100 boxes for horse retirements and personal paddocks (each box is proided with its own private tack room), a dedicated stable for the riding school and a Club House, oufitted with wi-fi. The riding school can rely on FISE instructors of national relevance, that teach horse riding at every level, from the basis to the improvement of personal ability and tecnique, until the competition training. During summertime the center organizes summer camps.